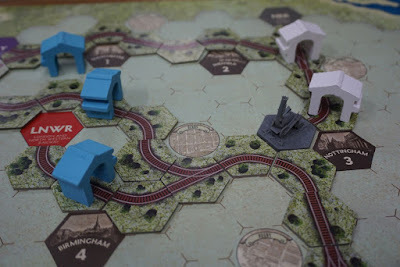 Stephenson's Rocket is an older game from Reiner Knizia. It was first published in 1999, and has been out of print for many years. 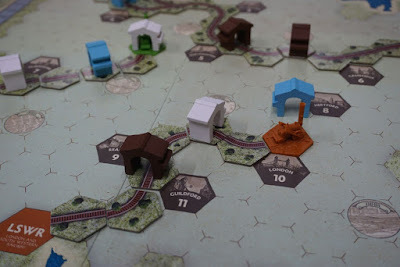 A new edition was released in 2018, and because of that I had the opportunity to try this highly praised game. 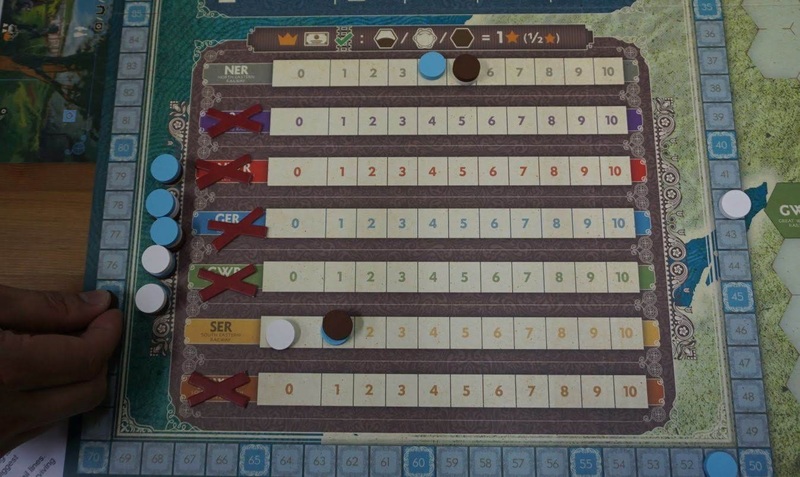 In the second edition, there were only small changes to the rules. The game components underwent a bigger upgrade. The train sculptures are nice. 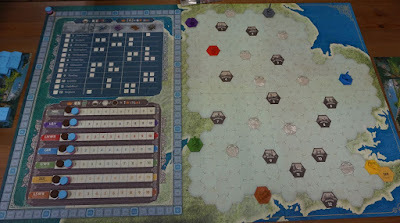 This is the game board. This is a map of England. There are cities (dark brown), towns (light brown) and starting towns (in the colours of the railroad companies). There are 7 railroad companies on the board, and their trains start on their respective starting towns. The upper left section is the city investment chart, which records who has invested in what factories at each city. The lower left section is the share tracks, indicating the shareholding status at each company. 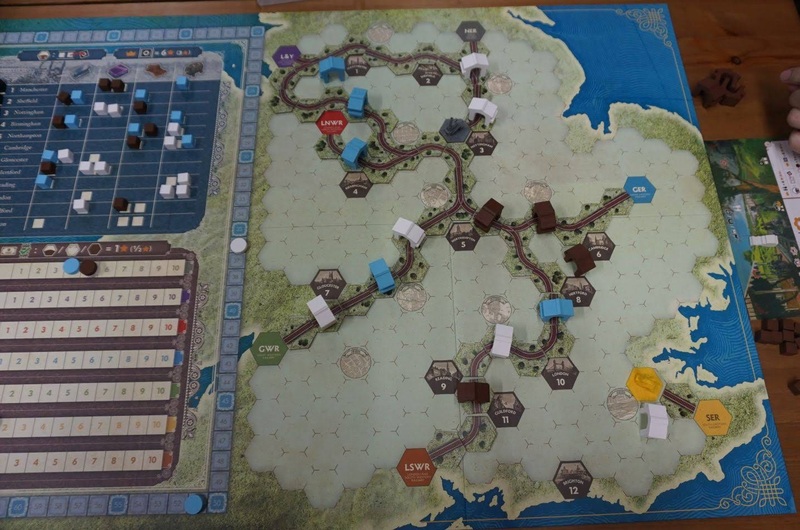 In this game you invest in and manage railroad companies. By holding shares in the companies and by owning train stations, you score points for the achievements of the railroad companies. To develop a company is to move the train and extend its tracks. When one company's train tracks meets those of another, these two companies merge. As the game progresses, the number of companies dwindle, and when there is only one big train network left, the game ends. On your turn you have two actions, and there are only 3 options to pick from. You may mix and match in any way you like, except you can't develop the same company twice on the same turn. Let's talk about developing a company. What you do is simply move a train one step forward, to one of the three spaces in front of it. It cannot move backwards. On the space the train has just left, you lay a train track, thus extending the railway line. Imagine a snail slithering forward and leaving behind a trail of slime. The train in this photo has moved 3 times. I started on the orange starting town. The first move was towards the northeast. 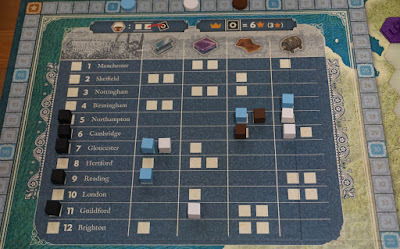 The second move too, and that connected the railroad to Guildford, a city. 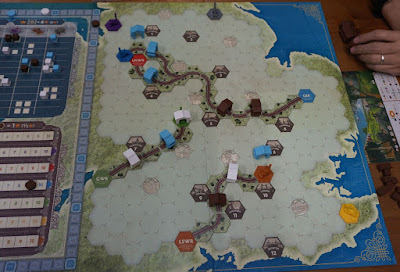 The third move was towards the north, and this connected the railroad to another city - Reading. That brown building is a train station, built by a player. Whenever you develop a company, you gain one of its shares. This is how you get yourself a stake in the company. When you move the train, any other shareholder may call for a veto and suggest a different direction to take the company (pun!). A bidding process ensues to determine where the train will go. The bidding is done using shares you hold, and shares are precious. So vetos are not to be taken lightly. The second type of action is to build a station. In this photo I (white) had built one of my stations. Stations must be built on clear land and must not touch any train when being placed. When this particular station was built, the yellow train was still on its starting town. I had hoped that when this train company was developed, the train would come to my station. Unfortunately things did not work out the way I wanted. Stations help you score points. 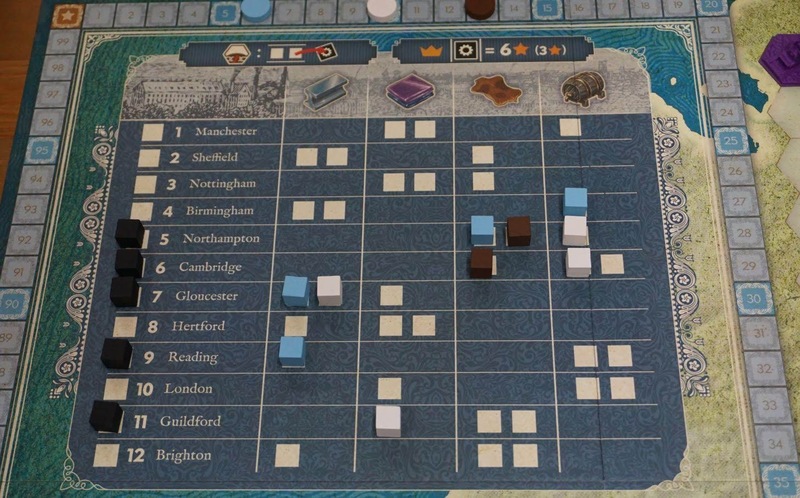 Every time a railroad company reaches a new town, scoring is done based on the number of cities, towns and starting towns it is connected to. 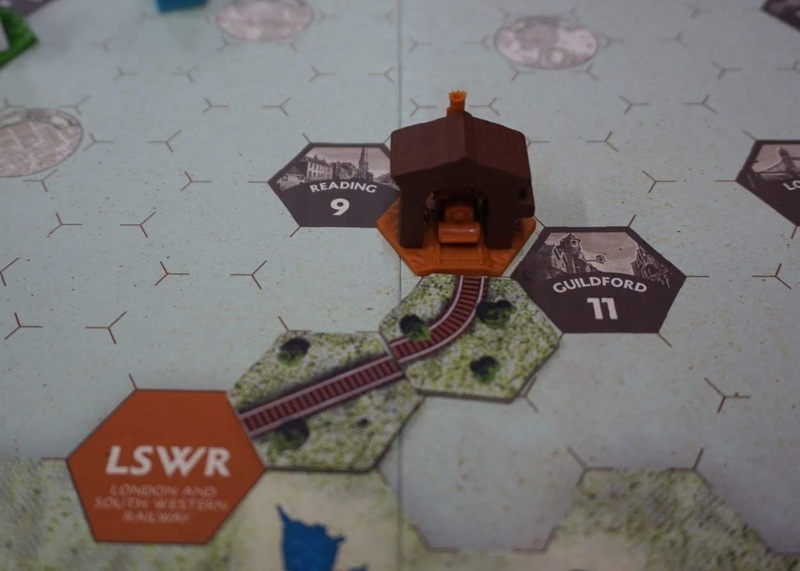 The player with the most stations in the railroad network scores full points. The player with the second most scores half that. If a company visits many towns, this scoring will be done many times. Also when companies merge, they become more and more lucrative because they will have more and more cities, towns and starting towns. When being built, a station is at least two steps away from the nearest train. That means you need foresight and forward planning. After you build your station, you need to try to guide the train to it. Else your station is wasted. The need for a train to go or to not go in a certain direction is why the veto mechanism exists. Another important mechanism is the passenger mechanism. If you drive a train to an opponent's station, you earn one passenger. At game end, whoever has the most passengers gains 6VP. Second place gains 3VP. Passengers create an incentive to help your opponents. Now the third action type - investing in industry. 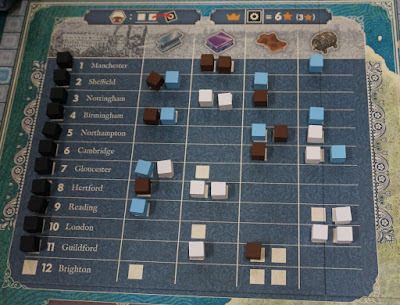 You build a factory in a city by placing one of your cubes onto an empty space on the city investment chart. Each row on the chart represents one city on the board. 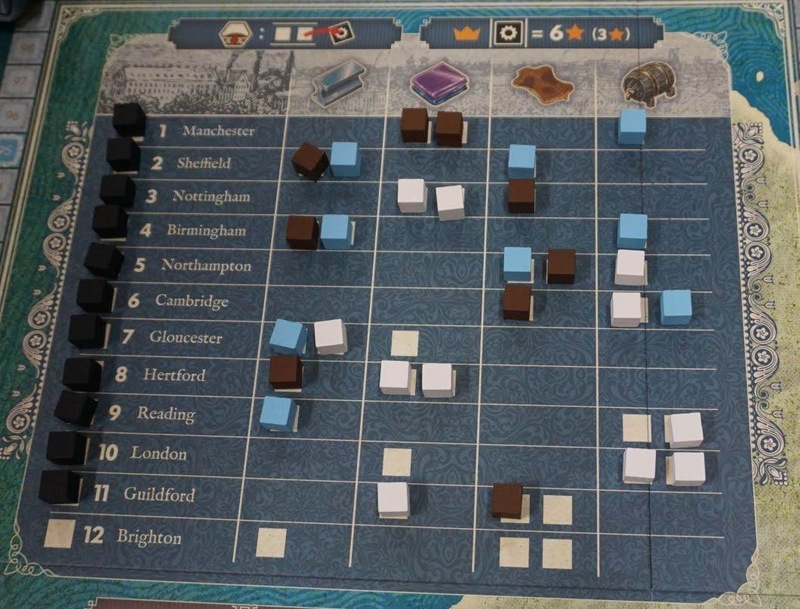 Each city has three slots. The factories you may build are of four industry types. At game end, each industry is examined. Whoever has the most factories gains 6VP. Second most gains 3VP. There is one condition. If a city is not connected to any railroad, its factories are discarded and do not count. The black cubes on the city investment chart remind you which cities have been connected to railroads. This is the player board. Those at the top left are the stations. The icons remind you where you can and cannot place stations. Those two in the centre are passengers collected. The lower left section reminds you the scorings to be done in three situations: (1) when a railroad reaches a city, (2) when a railroad reaches a town, and (3) when a railroad company merges with another. The lower right section reminds you of the end game scorings. All these icons look intimidating, but once you understand the rules, they are very handy. Let talk mergers. There are only 7 companies on the board, and thus at most 6 mergers per game. However these can be critical moments in the game. You must prepare well for them. When a train touches the track of another, it is acquired by the other train company and it ceases to exist. The biggest shareholder scores points based on how many cities, towns and starting towns the company has (before the merger). The second biggest shareholder scores half that. All shareholders then swap their shares for those of the new company, at a 2:1 ratio. The result of the merger is a bigger company with more cities, towns and starting towns. The new company will be more valuable. This is how escalation happens in the game. I have mentioned several ways of scoring. The most important two are the mergers, which is based on shareholding, and connecting to towns, which is based on station ownership. Other ways of scoring are still important, but they are supplementary. 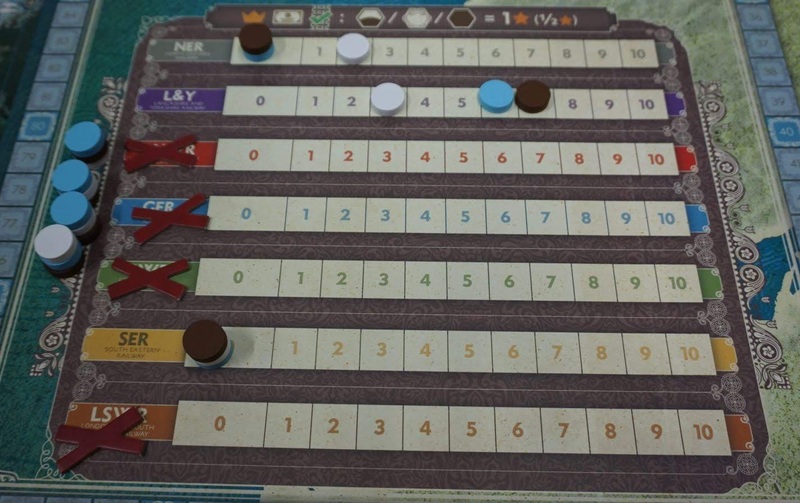 Understanding the rules doesn't help much in understanding how the game feels when in play. Let's talk about the play. 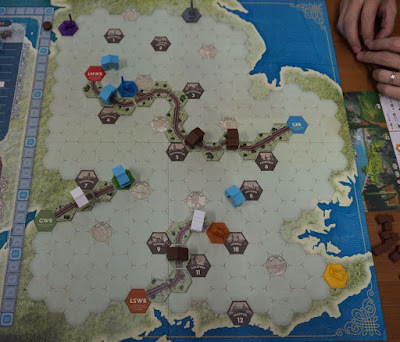 I did a 3-player game with Allen and Jeff. 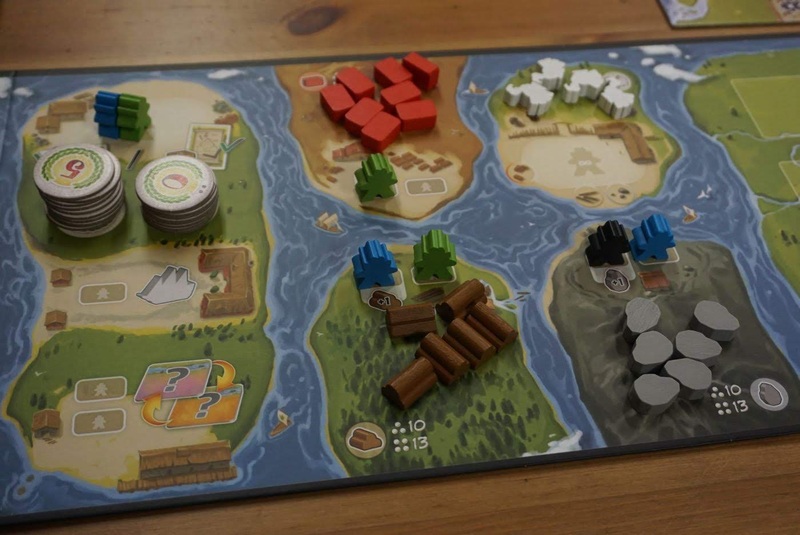 The game supports at most 4 players. I was white, Jeff was brown and Allen was blue. In the early game only three companies were activated, the green company in the west, the dark blue company in the east, and the orange company in the south. At this point our station building was balanced, and trains tended to go to the stations, because of the lure of the passengers. Jeff (brown) invested more effort in the dark blue company. He developed it more, so he became a clear majority shareholder. The seeds of disaster were sown even at this stage, just that Allen and I hadn't realised the danger. The dark blue company grew bigger and bigger, becoming unstoppable. At this point the red company had started operations, and had also merged with the dark blue company. Jeff (brown) was in control of the dark blue company and diligently developed it. Allen (blue) and I (white) wanted a piece and jumped in. However this was probably not such a good idea. Although we gained shares, we could not catch up to Jeff, and we only helped grow the company even further, benefiting Jeff. Jeff (brown) not only was the biggest shareholder. He also had the most stations at the dark blue company. Allen (blue) wanted to compete with Jeff in the number of stations. He had now built a station near the dark blue train, hoping to bring the train to his station. The green and orange companies were in an awkward position, being neither here nor there, having fallen far behind the dark blue company. 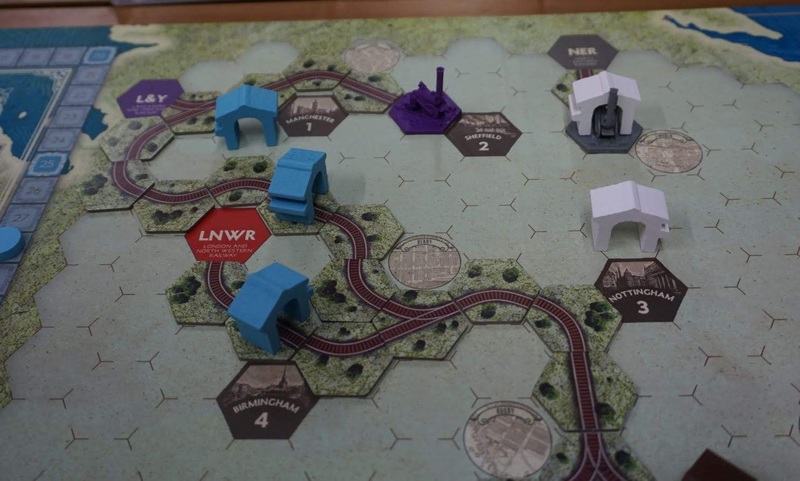 Allen (blue) had built a station hoping to get it to become part of the orange railroad company. If this happened, all of us would have one station each, and nobody would have any advantage. At the top left, the dark blue train had veered left and avoided Allen's (blue) station. Now the situation was Jeff (brown) and Allen (blue) both having two stations. The green train was heading towards the tracks of the blue train, so a merger was imminent. 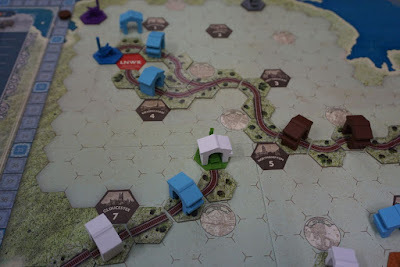 There were two white stations (mine) and one blue station (Allen's) in the green company. When the merger happened, Allen would have three stations in the merged company and become the player with the most stations. The purple company in the northwest, the grey company in the north, and the yellow company in the southeast, were all still dormant. The green company had now merged with the dark blue company. There was no more green train on the map. Every merger may create a major shift in shareholding positions. If some players hold many shares in the company being acquired, their old shares will be converted to a significant number of shares in the new company. This can shake things up. Since the share conversion rate is 2 to 1, you want to create mergers when your opponents are holding an odd number of shares, because this makes them waste that odd single share. Whenever a company is acquired, you give it a big red cross in the share tracks section. The prestigious dark blue company was later acquired by another company - the purple company. On paper it was purple gobbling up dark blue, but in practice this was not the case. Jeff (brown) had many shares in the dark blue company. After the 2:1 share conversion, he became the biggest shareholder in the purple company. Same old same old. The purple company started operations rather late, but it swallowed the four-in-one mega company and became the new giant. 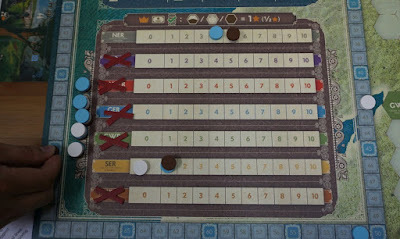 The dark blue company had triggered scoring many times when it was in operation, and Jeff was the biggest beneficiary. Allen and I knew it was nigh impossible to catch up. We tried to focus on different areas, competing with Jeff separately and trying to force him to fight two fronts. Not that it helped much. We should not have let things get to this point in the first place. We should have been more alert. In Stephenson's Rocket you need to think ahead and understand the implications of your actions and your opponents' actions. It is thoughtful and deliberate. Allen (blue) had the most stations in the purple company now (four). I helped make this happen, because I'd rather him gain an advantage than Jeff. Can't have Jeff be number one everywhere, no? If you trace the path of the orange company, you will see it had avoided one of Jeff's stations (brown). Allen and I were desperate not to concede any more advantage to Jeff. We wanted to lose less horribly. The grey company was now alive. I (white) had set up two stations, with the intention to get them to join the giant company. Things went according to plan. The purple company was acquired by the grey company, and now I was the biggest station owner in the main train network - five stations. 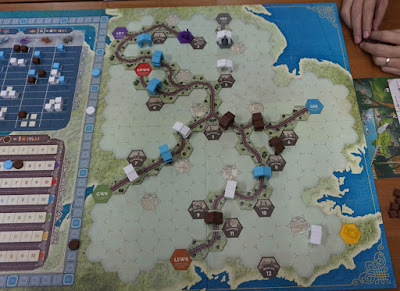 At the end of the game, only one city had no railroad connections - Brighton on the southern coast. Any factories built there were forfeit. Among the four industries, I (white) won majority in the cloth industry (second column) and the brewery industry (fourth column). My (white) final score was 42, Allen (blue) 51. Jeff (brown) was already far ahead of us, and still counting! In this situation, the grey company had become an isolated company. A company being isolated means it can't trigger any merger, nor can it reach any new city, town or starting town. Isolated companies no longer give shares, so you can't fight for share majority anymore. To be more accurate, the game ends not when six companies have been acquired. It ends when six companies have been acquired or have become isolated. 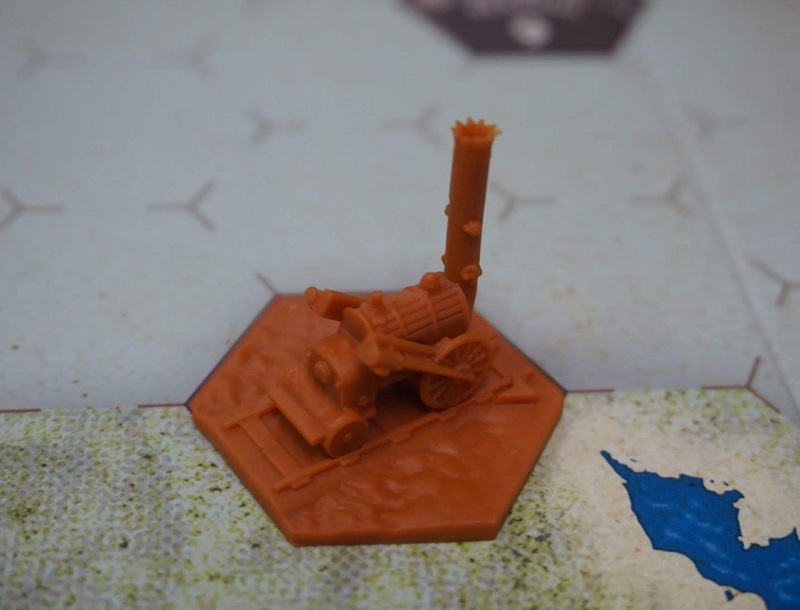 When I read the rules of Stephenson's Rocket, I thought it felt a lot like Acquire. Competing for shareholding is important, timing the mergers and reaping benefits from them is important. 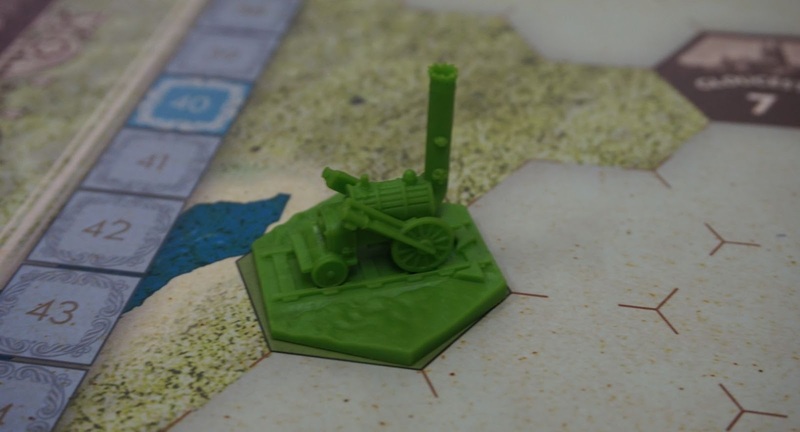 In Stephenson's Rocket there will be at most 6 mergers throughout a game. In Acquire there can be more. Stephenson's Rocket does not feel like a Reiner Knizia game to me. 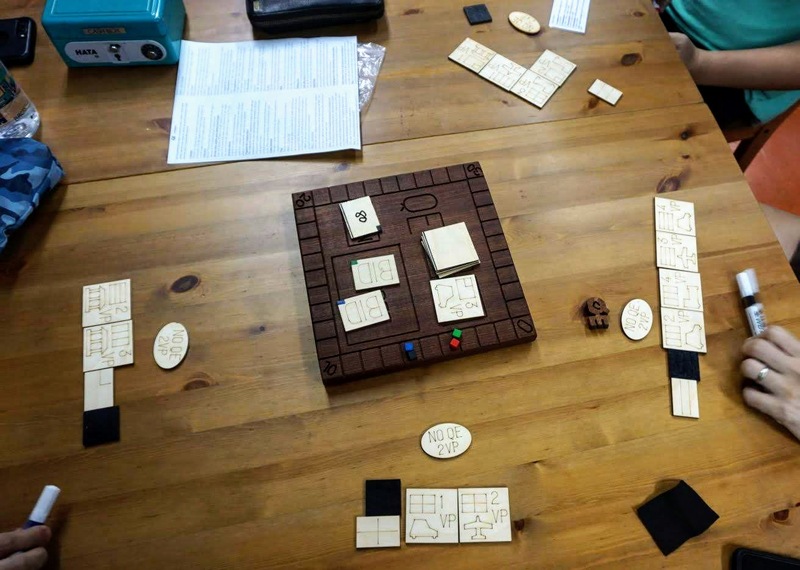 Many of his games are succinct and minimalistic. The ways of scoring are straightforward. The genius lies in the simplicity. Usually you can easily see where the twist is, and you will admire how clever it is. In Stephenson's Rocket, although you only have three options when you perform an action, these actions can have many long-term implications. When you move a train, you may trigger many other actions - the veto, and the various types of scoring. You need to understand the big picture and you need to understand the implications of every small action, and how they affect the strategic landscape. You need to think a little deeper. This is not a game I would recommend to people new to the hobby. Like Tigris and Euphrates, you need to know what you're doing in order to enjoy the game. It's not the kind of game you can muddle through half of, grasping the tactics along the way, and just enjoy the fun ride. This is an open information game with no randomness. This is actually a little intimidating. Imagine Chess, and Go. They sound serious and unforgiving, and very much skill-based. Stephenson's Rocket is not exactly like those games, but it does share some of their features. How a game develops is solely based on the decisions of the players. There is no luck and no randomness. Skills matter. An experienced player is expected to defeat a novice. It is better to play this game with opponents of a similar skill level. If there is a gap in skill level, you probably should to play with open discussions and analysis to guide the less experienced players. Else they will likely get trounced by the veterans. 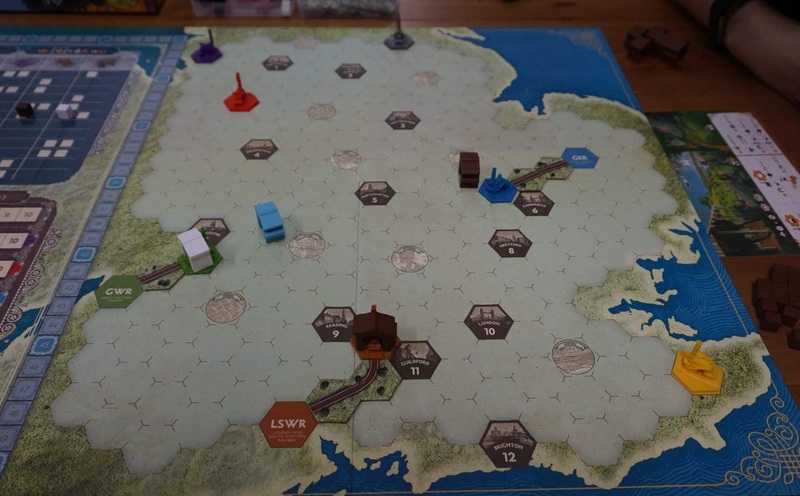 Having played Stephenson's Rocket, I feel I understand why it was not as popular as Reiner Knizia's other games of the same period. Games like Ra, Through the Desert and Modern Art had reprints much earlier and much more frequently, and didn't have to wait 19 years. Stephenson's Rocket is not a wide-appeal game like they are. It is not as straightforward, so it is not as immediately rewarding. It is a more deliberate game. Those who have learned to love it truly enjoy it, and that's why there had always been people asking for a reprint. The green train looks good too. Unfortunately green is a company colour and not a player colour. I always prefer to play with green pieces. White is my second choice. Cryptid is categorised as a deduction game. You are zoologists searching for the lair of a mysterious creature - the cryptid. You have gathered different clues, and if all clues were put be put together, you would immediately be able to find the lair together. However everyone wants to be first to find it and claim the glory for himself. So you try to tease information from your colleagues while you try to protect your own clue from them. Whoever is first to find the cryptid's lair wins the game. 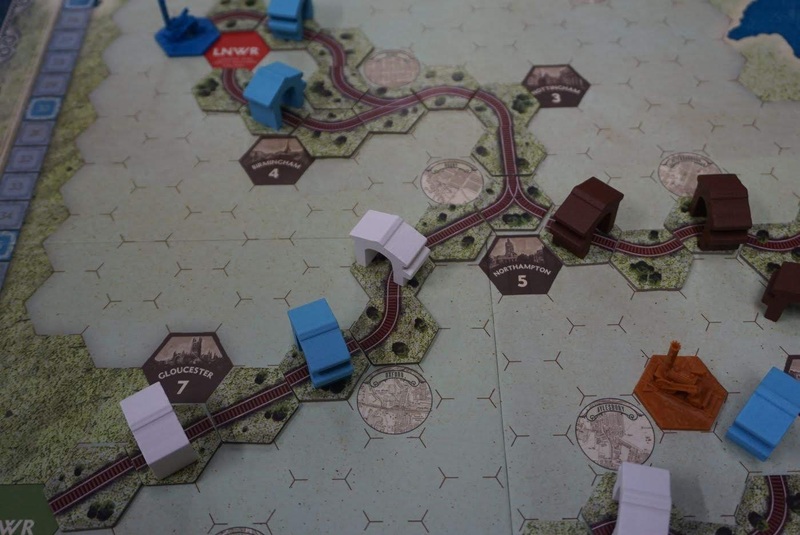 The game comes with many scenario cards. Before you start a game you randomly draw one to be used. You set up the game board and landmark pieces on it based on the scenario card. 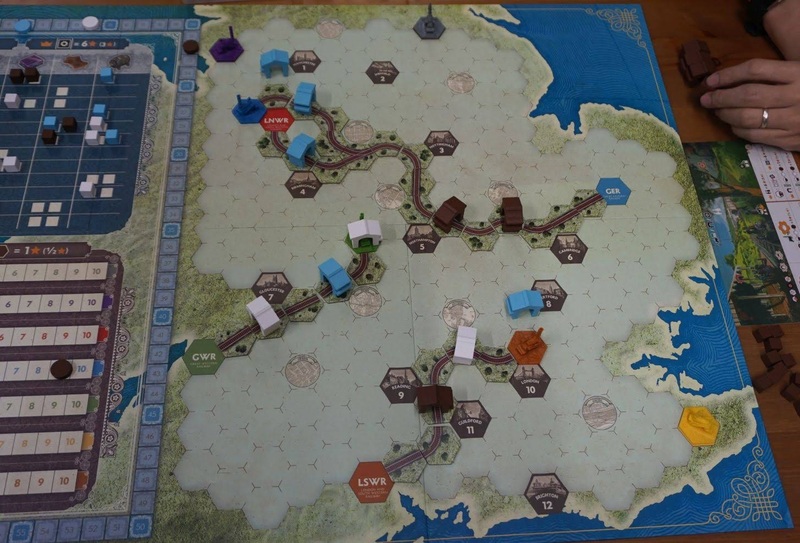 The spaces on the board are of various terrain types, e.g. deserts, lakes and forests. The back of the scenario card specifies which clue each player gets. 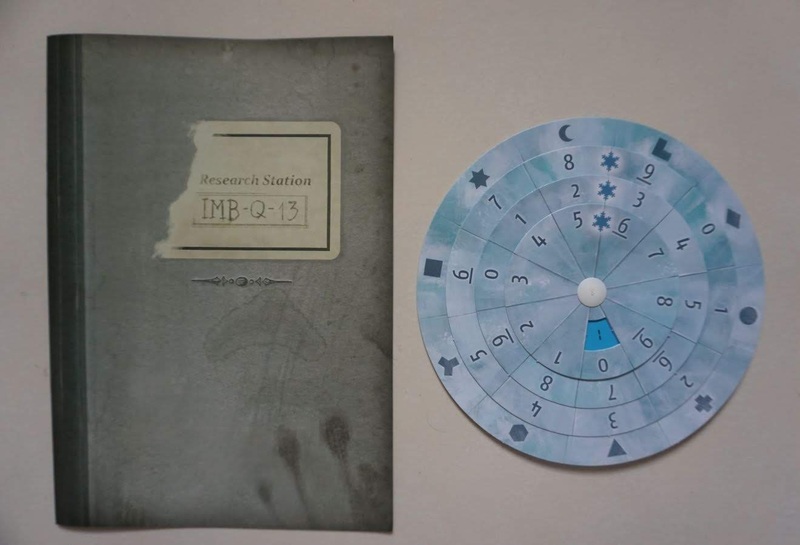 If this particular card is used for a 3-player game, one player would get clue #17 from the red booklet, another would get clue #45 from the green booklet, and the third would get clue #84 from the blue booklet. Everyone keeps his clue secret. 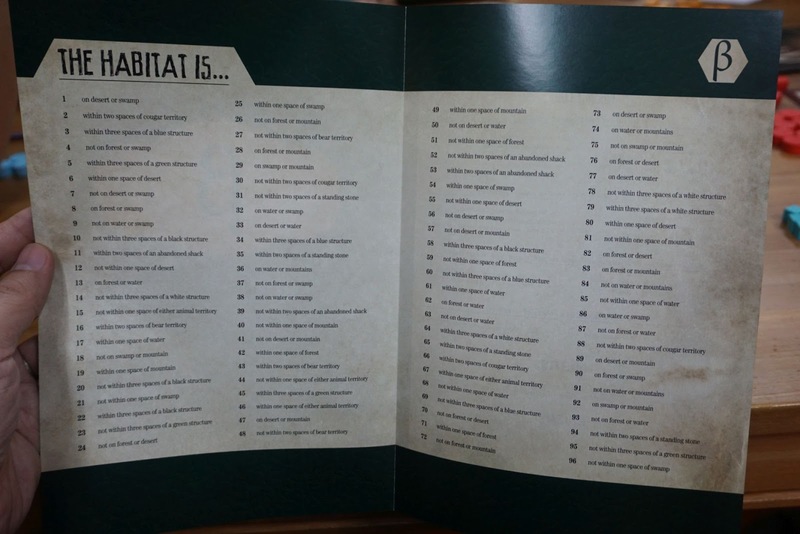 The player booklets list many many clues. Everyone gets a different booklet, and you look up your own clue in your booklet. Clues come in several types, e.g. the lair is on a desert space, the lair is within three spaces of a white landmark, the lair is within a bear habitat. By your own clue you cannot determine the exact location of the lair. It is only when all clues are put together that you can determine where the lair is. Only one space on the board fulfills all the conditions specified by the clues. 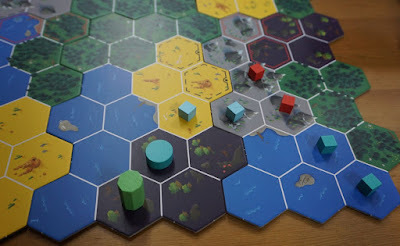 This is how the game board looks like once it is set up. Some landmarks are triangles (shacks), some are octagons (standing stones). If you look closely you will see some spaces with black dashed lines or red solid lines along the edges. These are bear and cougar habitats respectively. Every player has two types of pieces. Cubes mark spaces which are not the lair, according to the player's clue. Discs mark spaces which may be the lair, based on the player's clue. 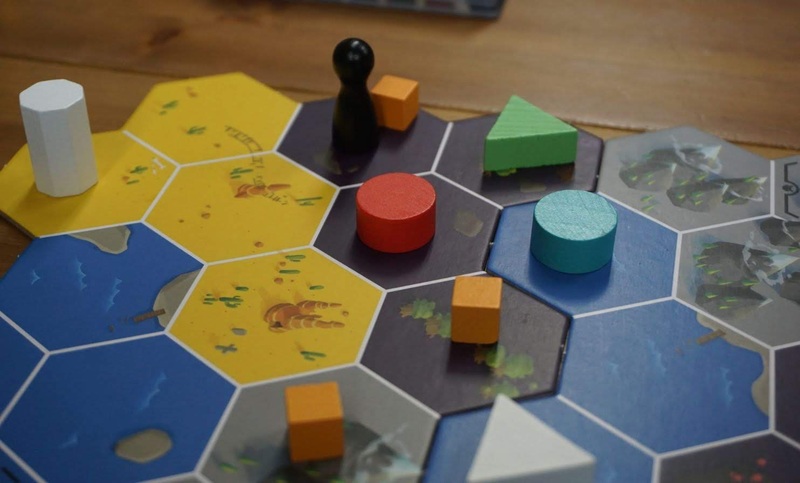 As part of setup, every player must place two cubes on the board. On your turn you have only two options. You either Question, or Search. 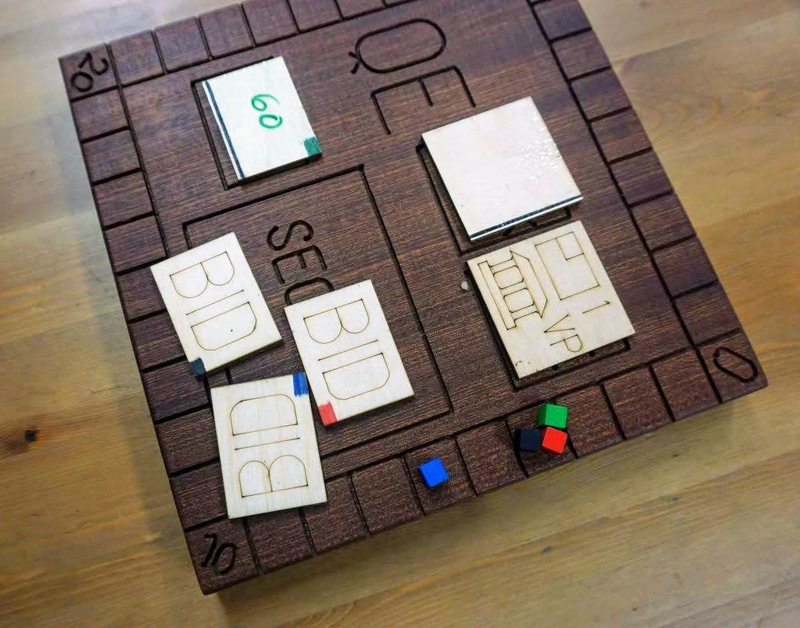 To Question means you pick one specific space on the board, then ask a specific player whether it is possibly the lair, based on his clue. He places one of his cubes or discs accordingly. If he places a cube, you must then place one of your own cubes somewhere else on the board. If you Search, you must pick a space which is possibly the lair, according to your clue. You place your own disc there (if one is not already there), and then starting from your left neighbour, your opponents check whether that space is possibly the lair. If it is possible, your opponent places a disc, and you move on to the next opponent. If it is impossible, your opponent places a cube, and the Search ends immediately (in failure). If you go a full circle and everyone places a disc, it means you have found the lair, and you win. This is a deduction game, the premise being you are searching for the cryptid's lair. 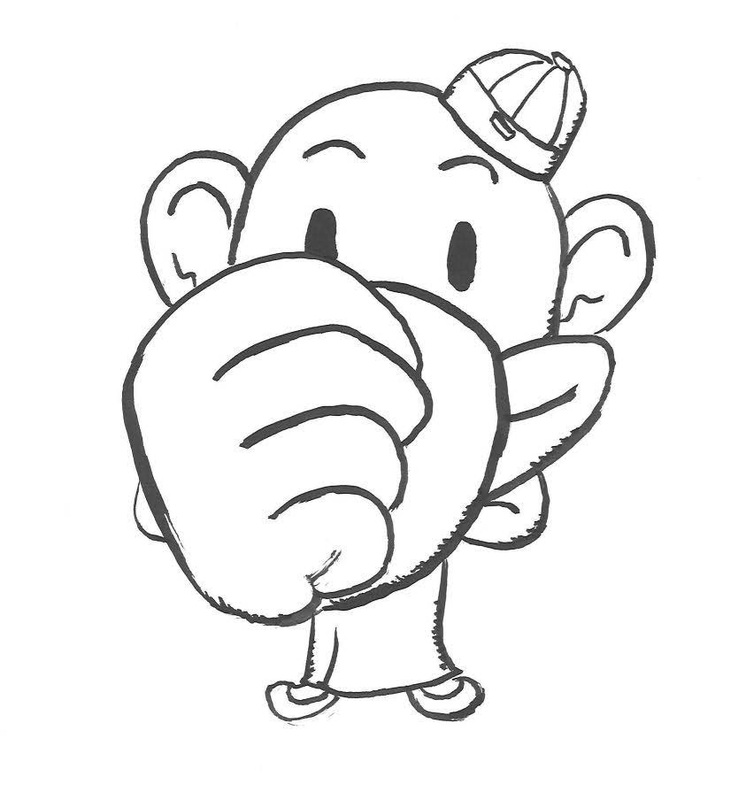 In actual playing, the feeling is more of trying to work out your opponents' clues while hiding your own. To find the cryptid's lair you need to guess what your opponents' clues are. There is a finite number of possible clues, and there are only a handful of types. 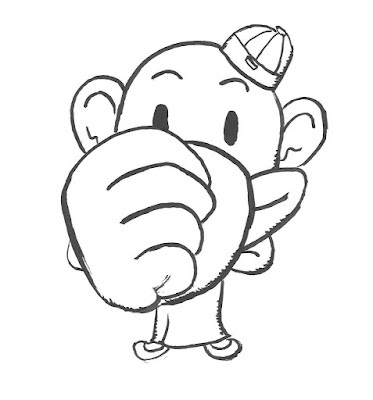 As more and more information is revealed, you will gradually eliminate possibilities and narrow down what your opponents' clues might be. You want to mislead your opponents, e.g. you can Question a certain space, even when you already know it cannot be the lair, just to confuse your opponents. Every cube or disc on the board is a clue. 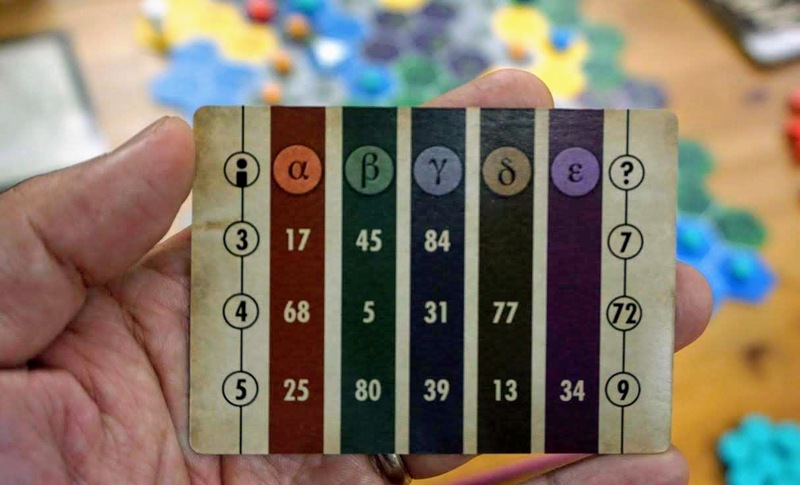 You analyse them by colour because they tell you what a particular opponent's clue might or might not be. You try to work out your opponents' thought processes by observing which spaces they pick to Question or Search, or place a cube. This is the kind of game where people make long pauses and think deeply and quietly, working out the various possibilities in their heads. Ideally with every turn you can tease out a little bit of new information. Either that or you use your turn to mislead others. My colour was cerulean, that not quite blue and not quite green colour. My clue was the lair was within 3 spaces of a green landmark. 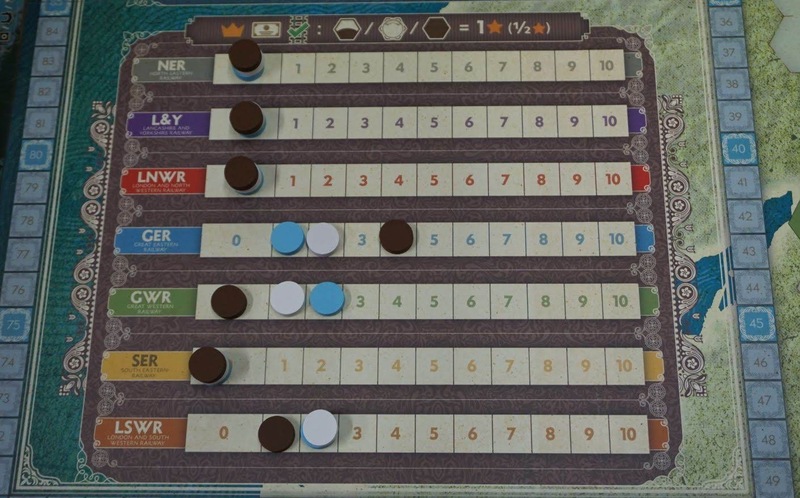 There were two green landmarks on the board, one in the top row and one in the bottom row. When I placed my cubes, I intentionally placed them on lakes, so that my clue appeared to be "not on a lake". Unfortunately I don't think I was able to fool people for long. At best I was able to minimise leaking more information for a little bit longer. At this point, I already had two discs on the board. Probably the others had already guessed that my clue was related to the green landmarks, because both my discs were immediately next to the green landmarks. When playing Cryptids you need to force your opponents to reveal information, and you must not allow anyone to hide more information than others. You want to hide your own information as best you can. The more you can hold back, the bigger an advantage you have. When Questioning, it is best to Question your opponents evenly, so that no one is holding back more information than others. There needs to be some ganging up on the leader, where the leader is whoever seems to be retaining the most information. In the game we played, we had this situation of everyone having rough ideas of everyone else's clue, except for one guy whose clue was still enigmatic to everyone else. Eventually it was him who found the lair and won. You use the black pawn to indicate the space you want to Question or Search. We did a 4-player game. The space with four discs was the location of the lair. Notice that there was a space with three discs and one cube. This was a close guess, because this was a possible lair space according to 3 out of 4 players. Only the orange player's clue denied that this was the lair. Cryptid is different and refreshing, and I enjoyed these. It is not yet another victory point scoring game. It will give your brain some exercise, because it's not a game you can play by gut feel. You have to do much calculation. You must think through the many possibilities and eliminate them one by one. You need to have the patience to do this. The game is not difficult to learn. Non-gamers and casual gamers can pick it up with no problem. 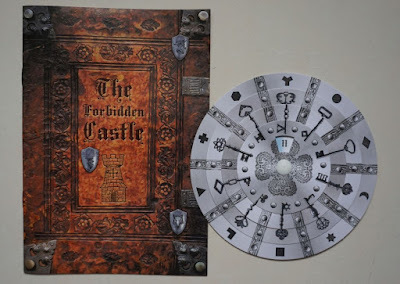 The premise of the game is searching for the cryptid's lair, but really it's about probing your opponents to find out their clues, while doing your best to protect your own clue. So it's more like spy agencies protecting their own secrets while trying to find out their enemies' secrets. It is a race to collect all the pieces then assemble them to find the truth. Q.E. is short for Quantitative Easing (not Queen Elizabeth). I had to look that up on Google. 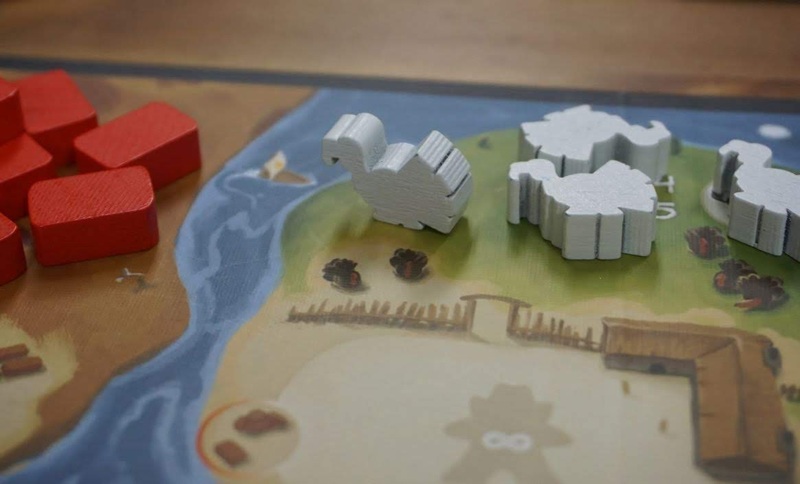 The first edition of the game was handmade with wooden components. Only a small number was produced, and not many people managed to buy a copy. The game had good reception, and that eventually led to a new edition being Kickstarted. The Kickstarter campaign funded successfully, and the new edition is expected to ship mid 2019. I played the first (wooden) edition, which had basically zero artwork. The new edition is much prettier. Let's talk about the game. You are central banks of four countries. The world economy is in the doldrums. Giant companies are failing, and the central banks cannot afford to have them go bust. So the central banks must buy out the companies to save them, and to do that they are going to print money. They are central banks afterall. 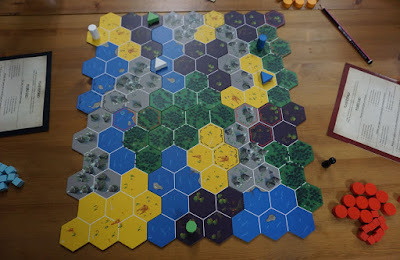 We did a 4-player game. There are 16 companies in the game, from four different countries, and four different industries. These are evenly distributed. Throughout the game, the companies are auctioned off one by one. The game ends when all companies are sold. To start an auction, the active player flips over a company tile, and then decides how much he is willing to pay for it. The others then secretly bid for it. Naturally if you intend to buy it, you must bid a price higher than the active player's. The active player examines the prices offered by everyone. If someone other than him wins the auction, he announces the winner, but not the final price. Only the auction winner and the active player knows the final price. The other bidders only know that the final price is higher than whatever they have bid. That's all there is to the auction mechanism. Nothing complex. What make the auctions interesting are two things - (a) the unlimited money printing, and (b) the scoring. You hold no cash. When you bid, you are free to bid any amount. You don't need to have any cash to pay for the company immediately. Remember, you can print money. This sounds ridiculous. The twist is that at game end, whoever has printed the most money automatically loses. Only the others will compare scores to determine who wins. There are many ways to score points from the companies you buy. The companies themselves are worth victory points, ranging from 1VP to 4VP. A 4VP company is naturally much more attractive than a 1VP company. You are the central bank of a country. If you buy a company from your country, you gain some points. Before the game starts, you are secretly assigned an industry to support. If you buy companies of that industry, you gain points too. You also gain points if you are well diversified in the industries you are involved in. All these ways of scoring are meant to create value in the companies, and to create differentiation of value to different players. You need to think about how much a company is worth not only to you, but also to each of your opponents. During the game, once per round you can bid $0 (i.e. give up on bidding) to earn 2VP. 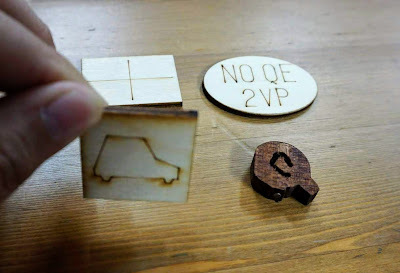 2VP is not much, but if you are not interested in a particular company, or you don't think you can win it anyway, you might as well take the 2VP. The rules are not complicated. However, knowing how much to bid is much trickier. The tile at the top right is the company being auctioned off. The company tile specifies country (France, I imagine in this case), VP value (2VP here) and industry (automobile). At the bottom left, the active player (me, green) has set a price of $8. Red and black players have written down their bids and placed their bid tiles on the board face-down. That's my country flag at the top left (England?). At the lower left, the automobile industry is what I have been secretly assigned at the start of the game. The oval marker at the top right reminds me that I have not yet claimed the 2VP for not bidding. Whenever I claim this benefit, I need to flip the marker over as a reminder to not do it again until the next round. 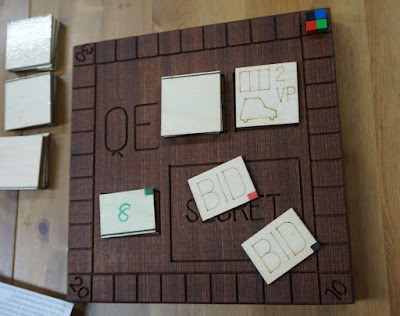 The letter Q is the start player marker. The start player changes every round. If you compare this photo with the first, you will notice that the price has increased from $8 to $60! This is inflation, and this is what money printing leads to. This is a game of brinkmanship. How high dare you go? In the game we played, Allen and I were conservative, and that served us poorly. You do need to win companies to score points. You are not progressing if you don't win companies. You need to bid high to win companies. You just need to make sure you are not the one who spends the most money by game end. This is the balancing act. You want to be second place in the race, because the first place will crash and burn. You want to run fast enough to stay ahead of the rest, but you must not overtake the first place. Jeff (right) and Player A (top) were more aggressive in bidding, and won more companies than Allen (left) and I ( bottom). At this point, the open price was already $80, compared to the $8 in the first auction of the game. The companies bought in the early game were real bargains! I suspect inflation is inevitable every game, the question is only how quickly and by how much. Everyone is under pressure to bid higher and higher in order to win the companies. By the end of our game, it was obvious the winner would be either Jeff or Player A. Both of them had decent portfolios of companies, while Allen and I had fewer companies. It was a question of who would be disqualified due to having printed too much money. We scored everything else and left the disqualifying step at the end, to keep things exciting. After we summed up our spending, it was Player A who had spent the most, so Jeff was the winner. Allen's score and mine were close as we built up to the final reckoning. There was a bonus for whoever had spent the least amount of money. It would determine who between us would win second place. After adding up our spending, it was Allen who had printed the least money, so he was the most prudent central banker, and I ended up last on the scoring track. Q.E. is simple yet thinky. You need to consider carefully how much to bid, and you need to guess how much your opponents are willing to bid. You need to evaluate how much a company is worth to your opponents. There can be a lot of serious contemplating and calculations when playing this game. This is certainly not a light and relaxing game, despite the simple components and few rules. It is almost like an experiment on economy and human psychology. This is a highly interactive game. The second edition will be much prettier. 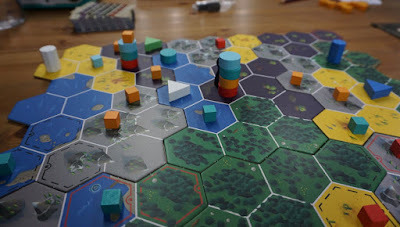 Photo source: Boardgamegeek. If you are interested in ordering a copy, try this link. The River is published by Days of Wonder. 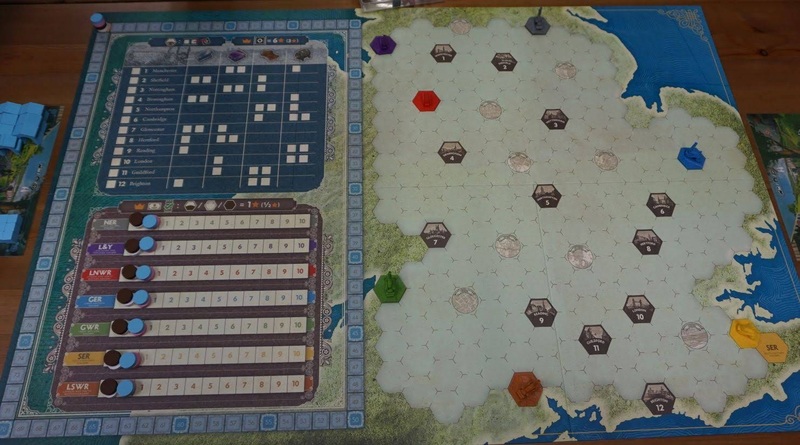 It is a light worker placement game. You are pioneers developing a new land. You develop plots of land to produce resources and to store them. You use them to construct buildings. Everyone has a personal board to work on. The game ends when someone develops his 12th plot of land, or when someone constructs his 5th building. Whoever scores the most points wins. This is the main board. 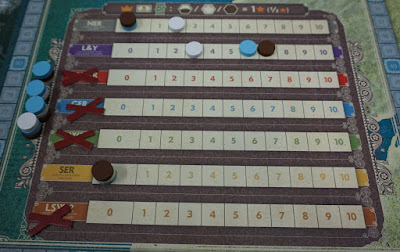 It is divided into many sections, each section allowing players to place workers under different rules to gain different benefits. Let's look at them one by one. This section of the main board lets you develop land. 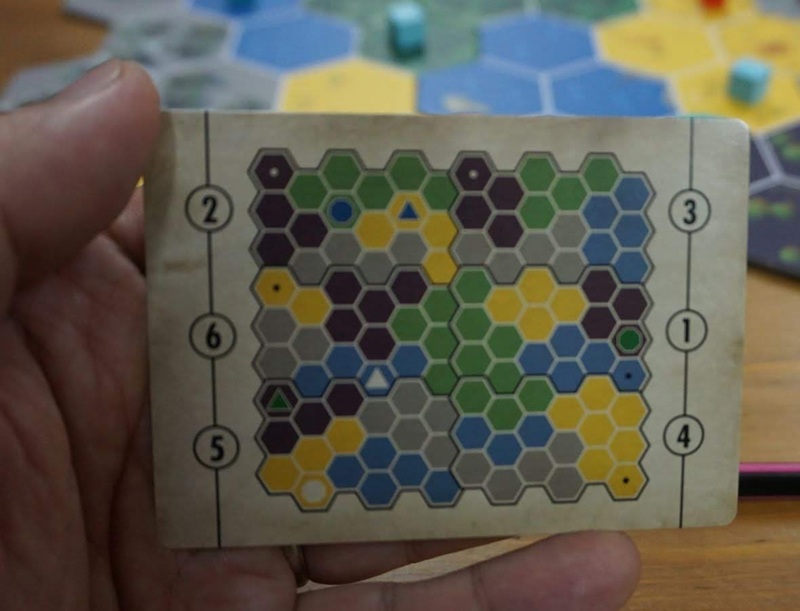 You pick a land tile to place onto your player board. Everyone can send at most 2 workers per round, so there is no risk of running short of land tiles. However if you are slow you may not get what you want. So you still need to compete. The top left section is for constructing buildings. There is no limit to how many workers may come, as long as they can afford the building materials. Whenever you construct a building, you collect one of these round tokens. They have different values, and you always take the highest valued token remaining. 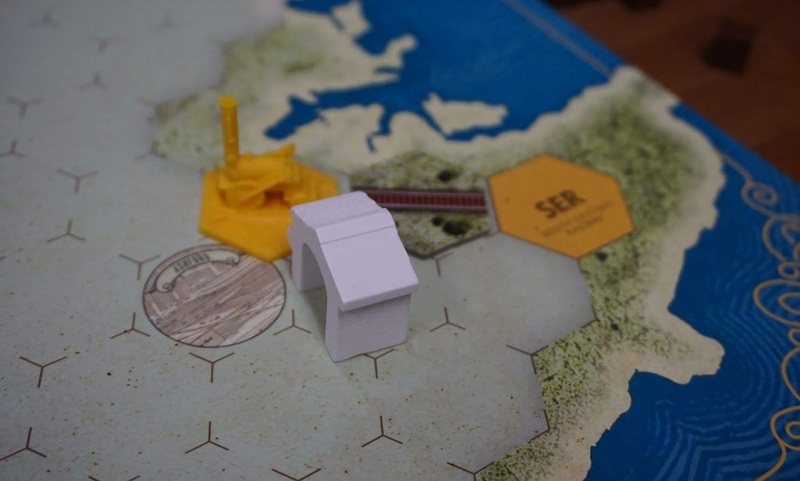 The section with a ship is for claiming the first player token. The bottom left section lets you swap land tiles. This is meant to help your land tile scoring at game end. The four sections on the right are for producing resources. The number of each resource type in the game is finite. If there is not enough in the supply pool (i.e. on the main board), you will not be able to produce to your full capacity. 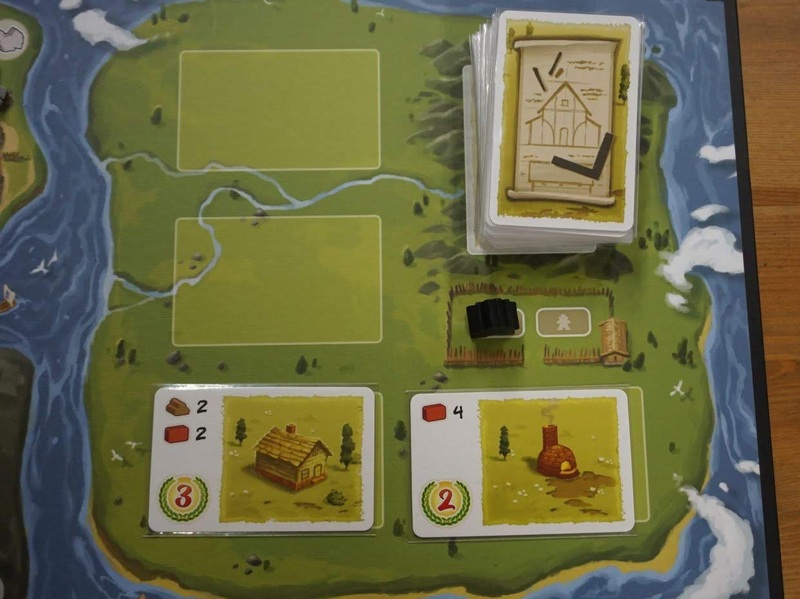 Your production capacities for wood, bricks and stone depend on your player board. If you are first to produce a certain resource type, you get to produce an extra one. A turkey is a wild resource. Each worker sent to catch turkeys catch exactly one turkey. This section holds the buildings you may construct. It is refilled at the start of every round. When you send a worker here, you don't construct a building. Construction is done in another section (photo above). When you send a worker here, you claim one building card into your hand. You are reserving the building so that no one else can construct it. In future when you construct it, you pay one resource fewer. This is the player board. 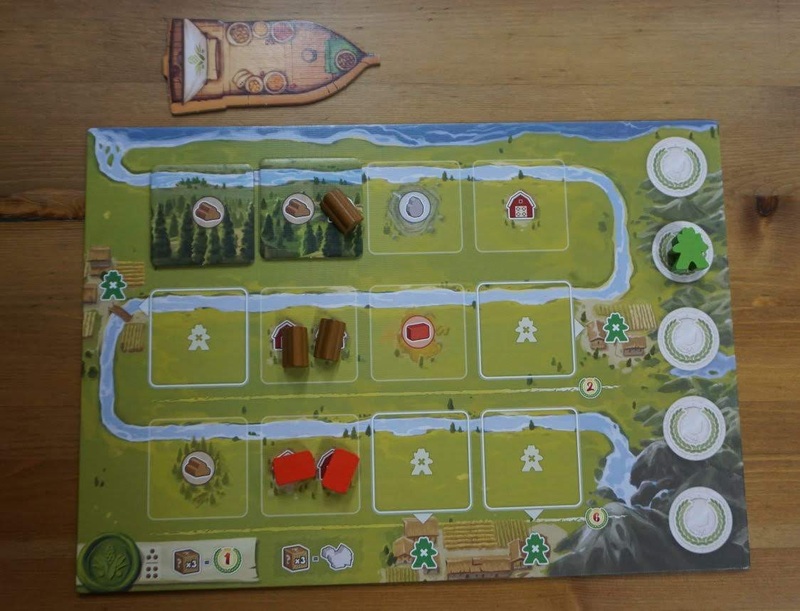 From the river mouth to the source, there are 12 plots where you can place land tiles. 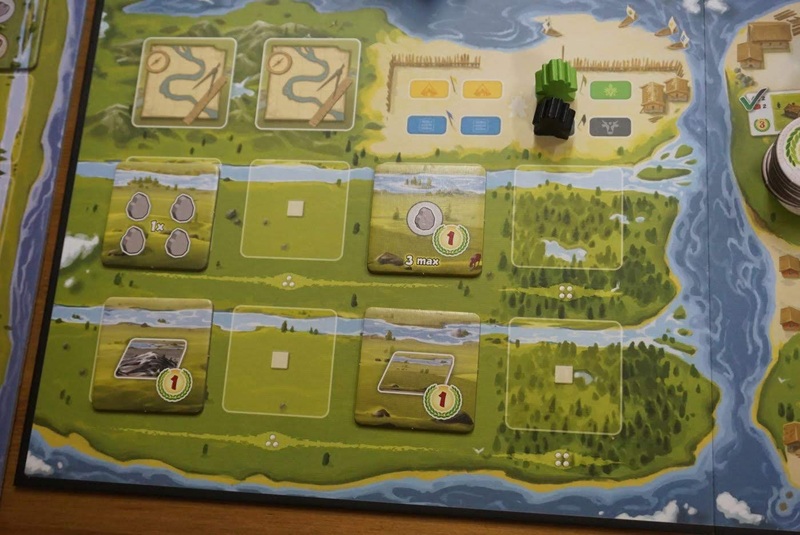 You must develop land starting from the river mouth and moving step by step inland, following the river. The resource icons are your production capacity, and the barn icons your storage capacity. Some of these are pre-printed on your board. 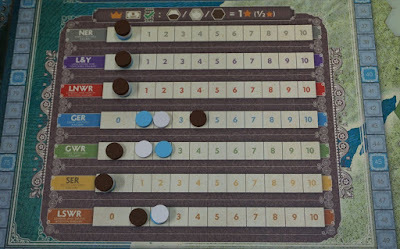 The player boards have different distributions of these pre-printed icons. When you place tiles to cover such icons, you lose the benefits accordingly. The five circles on the right reminds you that you may construct at most 5 buildings. The worker on the second circle means once you construct your second building, you get an extra worker. However, you may also lose workers. Notice those worker icons with crosses. When you place a land tile on such an icon, one of your workers will retire at the end of the current round. So you don't want to rush your land development. You need to consider the drop in productivity caused by this retirement mechanism. If you look closely, you will see the 2VP and 6VP icons at the bottom right of the second and third rows of land plots. These remind you of the end game scoring. For each column of land tiles, if the first two tiles have the same landscape, you earn 2VP. If all three tiles have the same landscape, you earn 6VP. When competing for land tiles on the main board, this is something you need to consider. 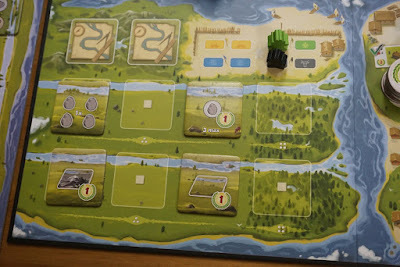 This is also why there is a section on the main board which allows you to swap land tiles. Resource production and storage are not affected by land tile position. 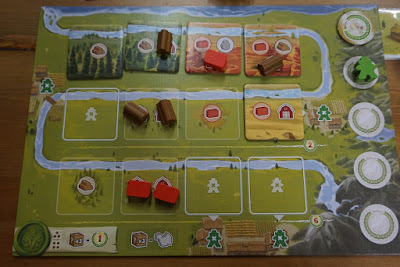 If you compare this photo with the previous one, you will notice that I have swapped two of my land tiles, in order to help me score points at game end. I'm aligning the tiles in my rightmost column. At this point one of my workers had retired and he was living on the farm at the first river bend. I had constructed three buildings, and they were all tucked under the right side of my player board. I did a 3-player game with Allen and Jeff. The max player count is 4. The River is quite light and straight-forward. 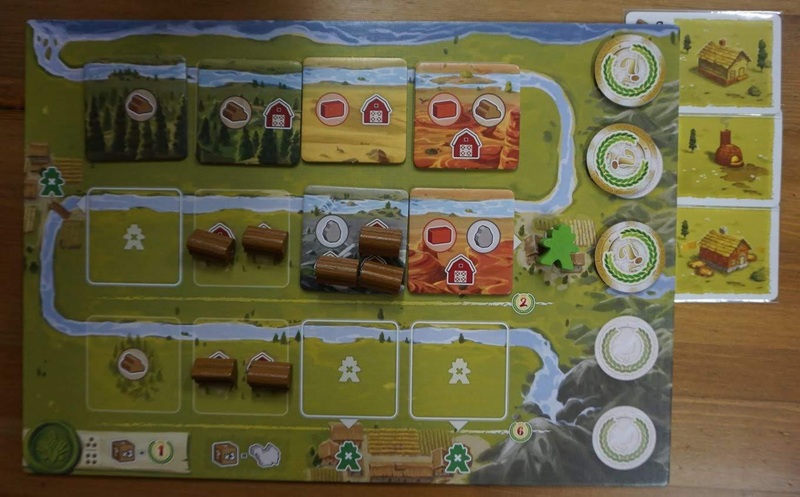 You develop the land to produce more resources and to be able to store them. You then spend your resources to construct buildings. That's the general flow of the game. However winning or losing is not only dependent on the buildings you construct. The land tile columns can contribute a significant number of points. Those special land tiles worth victory points can give you the critical edge too. When constructing buildings, you face a dilemma between speed and quality. On one hand you want to build early to grab the higher valued tokens, but on the other hand you want to amass more resources to build the higher valued buildings. The number of barns on your board tells you which buildings you will be able to construct. If you have only 7 barns, it is impossible for you to construct that 9-resource building. You can still go for a 8-resource building, by reserving it first, thus enjoying a 1-resource discount when you construct it from your hand. I played with a rush approach. I was not picky about which buildings to construct. I just went for whatever was convenient - whatever matched well with the resources I had produced. That was not exactly a good idea. All it did was forcing a quicker game end. By the time I reached the fourth building, everyone knew the end was nigh. Fast did not necessarily mean efficient in scoring points. I should have taken more care in trying to score more points, as opposed to just trying to score points quickly. Speeding up the game turned out to be bad for me, because I was behind in points. Spending one worker to claim one turkey sounds expensive, but sometimes a wild resource can be very handy. I am not the target audience of The River. If you are reading a boardgame blog and you know the term "worker placement", chances are you are not the target audience either. 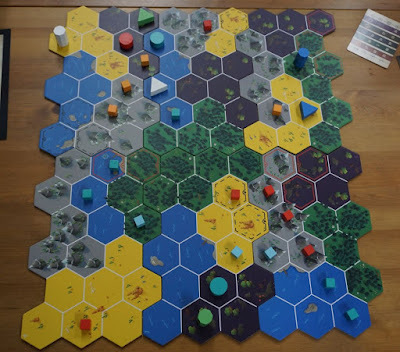 I have played many worker placement games, and if I feel like one, I would pick something meatier. For me, a boardgame hobbyist, a light worker placement game only serves one purpose. I can use it to introduce new players and casual gamers to worker placement games. This game is worker placement for families. It is meant for people who are relatively new to the hobby, and people who prefer light games. Wishing everyone a happy and healthy year ahead, with many joyous gaming moments! Late last year I bought three Exit games at one go. My wife Michelle was interested to play more, and suggested we play with the children during their school holidays. The children were happy to play, so I gladly bought the next batch. We seem to be doing worse than before though. For all three we spent more than 1.5 hours, and we had to use quite a few clue cards too. The riddles were still new and interesting. No overlap with previous ones we had seen. There were some with similar elements, but they were still fundamentally different. 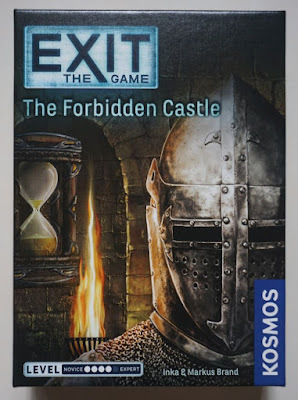 I am not specifically enthusiastic about Exit and wouldn't have actively sought to play more myself, but if my wife and kids are interested to play, I'm more than happy to have some family time. 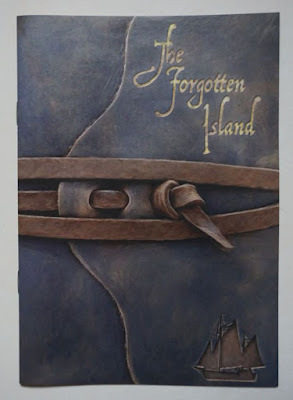 The Forgotten Island is about being stranded on a deserted island and trying to escape from it. The dial uses icons related to pirates and tropical islands. The booklet looks like a sailing journal. 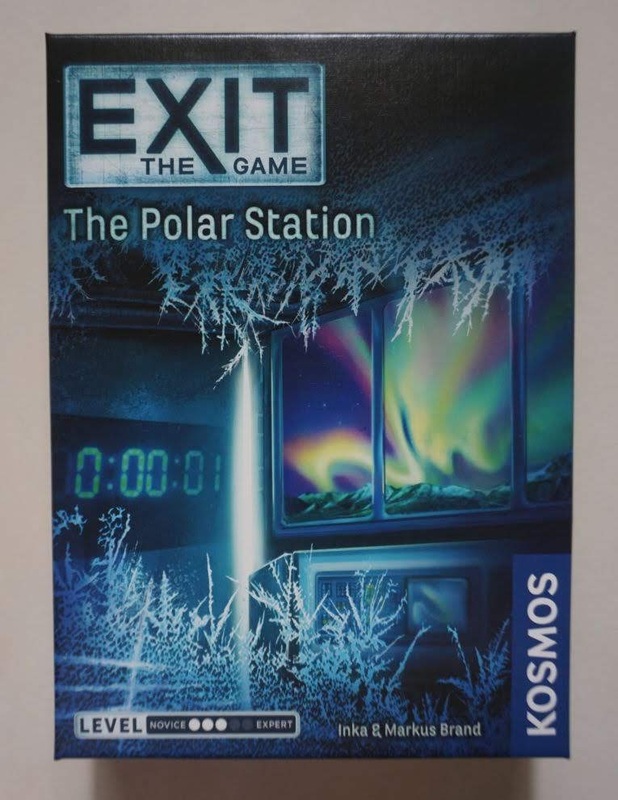 The Polar Station is set in a lab at the north pole. You are scientists trapped in a locked lab, and this lab has been doing some shady experiments. The booklet looks like a lab report. This time the dial uses numbers instead of icons, so you don't need to worry about converting numbers to icons and then looking for the icons on the dial. 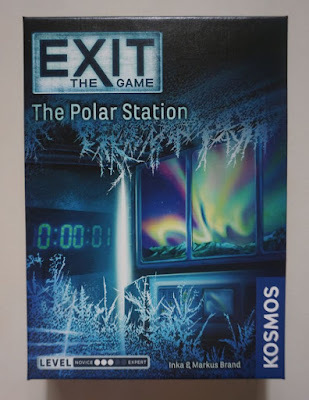 We played The Polar Station when we were in Kota Kinabalu, during the Christmas period. Michelle and I were back on holidays, and it was school holidays for the children. 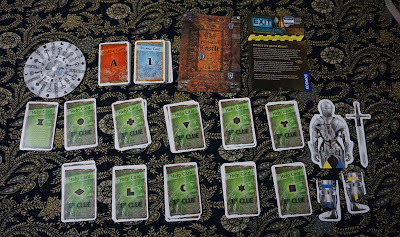 We spent 1 hour and 47 minutes to complete this game, and we had to use 3 clue cards. The Forbidden Castle has a higher complexity rating than the other two. It is rated 4 (of 5), compared to the rating of 3 of the other two. Indeed we found some of the riddles here quite cunning. The story here is written like a sequel to a previous game, but it is not necessary to have played the previous game. The two games are independent. It's just flavour. 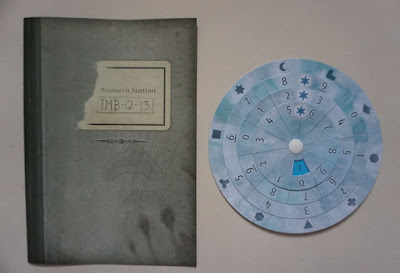 The booklet looks like an old tome. The dial is interesting this time. 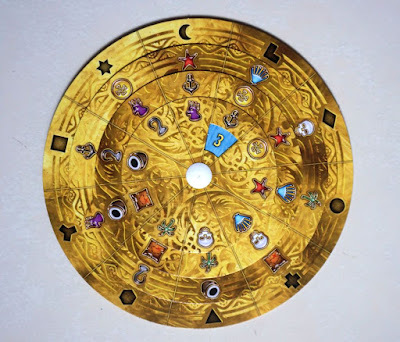 By rotating the segments, you construct keys of different designs. 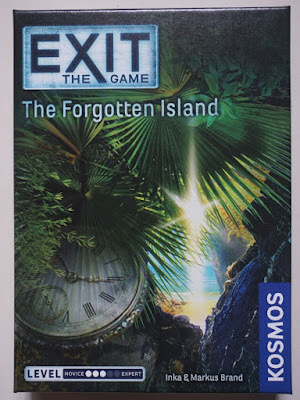 It still works the same way as other Exit games, just that visually it's beautiful. 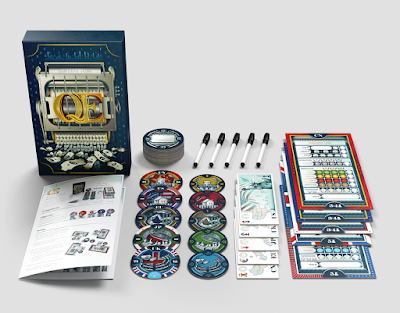 Most of the game components are standard - the red riddle cards, the blue answer cards, the green clue cards, the booklet and the dial. 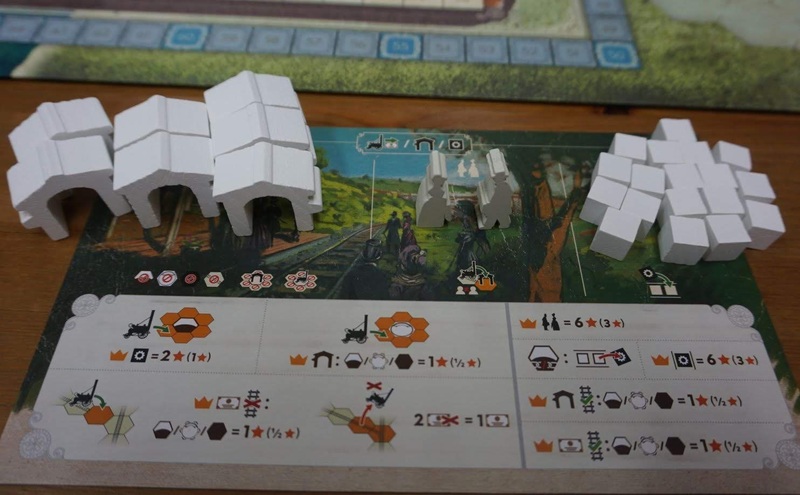 The unique game component this time is a suit of armour, which is fitting for this old castle setting. We took 1 hour and 44 minutes to solve this game. We used 6 clue cards. This might be a new record. 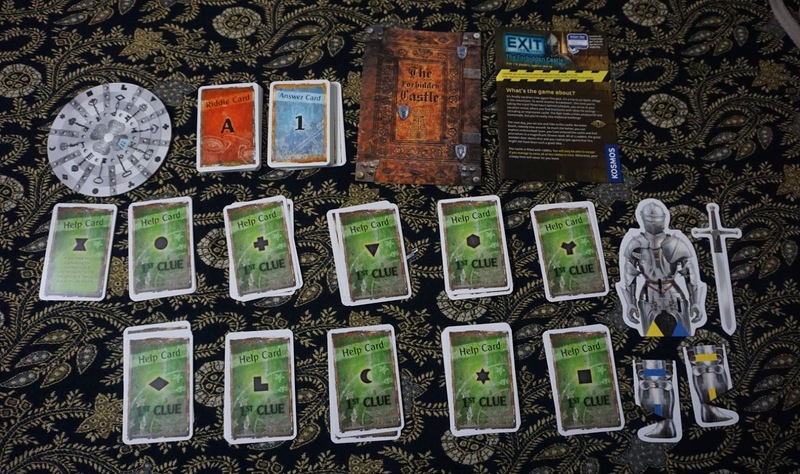 However for scoring purposes, we only counted 5 clue cards. 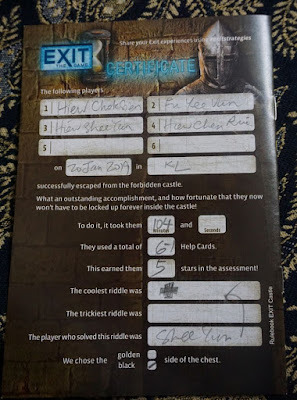 There was something we did during the game which allowed us to discount one clue card. Our final score was 5 points. The scoring is based on number of clue cards used and time taken. By now I have played 6 Exit games. They are riddle solving exercises. Generally I'm neutral about the series, but if the family is still interested to play, I'd gladly get the next set. I play Star Realms on my mobile phone a lot, but I rarely mention it. 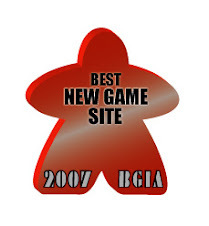 I mention it once a year when I review my year in gaming, because it has been among my most played games every year for the past few years. I have bought many of the Star Realms expansions. The most recent one is the Missions expansion, and it is why I want to talk a little about the game. I quite enjoy this particular expansion. When you use the Mission expansion, you draw three Missions at the start of the game. Whenever you complete a Mission, you gain some benefit. If you manage to complete all three, you win immediately. Examples of Missions include playing cards from three different factions on the same turn, having two outposts in play, playing a Trade Federation ship when having a Trade Federation base in play, and triggering Ally Abilities of two factions on the same turn. With the Missions expansion, you get an alternative victory condition. So far, the frequencies of these two victory conditions seem balanced. If you are falling behind in military strength, you can still try to steal a win by completing your Missions. Sometimes when you see your opponent threatening to win by Missions, you will feel under time pressure to beat him down before it's too late. The game feels more exciting - new opportunities, new threats. The luck factor increases somewhat. Sometimes you draw Missions which pull you in different directions, e.g. one that requires you to play three cards of the same faction, and another that requires you to play cards of different factions. On the other hand, sometimes you get Missions which are aligned. Some Missions require you play cards of a specific faction, sometimes even specifying whether it's a ship or a base you need to play. If such cards don't show up in the market, you won't be able to buy them to try to complete the Missions. Sometimes your opponent keeps buying them whenever they appear. Still, I find Missions fun and don't mind the additional luck. It is possible to guess your opponent's Missions by watching how he buys cards. If you guess correctly, you can adjust your play to deny him what he needs, e.g. buying cards he needs, destroying bases he needs to have in play. I must admit I'm too lazy to do such close monitoring. I try to guess more by gut feel. Leaders become more valuable now that there are Missions. When you buy a Leader, you can keep him on standby as long as you want. They don't get kicked to the discard pile by your opponent. Leaders are useful when your Mission requires activating Ally Abilities. You can keep your Leaders until you need to activate Ally Abilities.